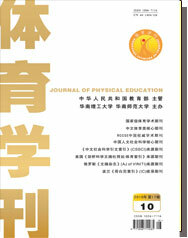 Abstract: The author investigated the situation of extracurricular physical exercises in common institutes of higher learning in Human province, and revealed that currently the deficiency of extracurricular physical exercises in common institutes of higher learning shows collectively in the following facts: the students have fewer frequency of and less time for extracurricular physical exercises; the number of schools that insist on extracurricular sports train-ing becomes fewer and fewer. The causes for such problems are mainly related to such factors as the schools having a week mass sports conception, week group activity organizing power and serious deficiency of playgrounds and fa-cilities, the students being lacking in independent exercising capability, and the sports competition mechanism being irrational. The author offered such suggestions as clearly specify key jobs and objectives in scholastic physical edu-cation, strengthen organization and leadership, complete regulations and systems, intensify class teaching reform, effectively cultivate student’s fitness exercising and entertaining capability, constantly organize the training of school representative teams, and enhance the technical performance of scholastic physical education.